In military slang, Predator drone operators often refer to kills as ‘bug splats’, since viewing the body through a grainy video image gives the sense of an insect being crushed. 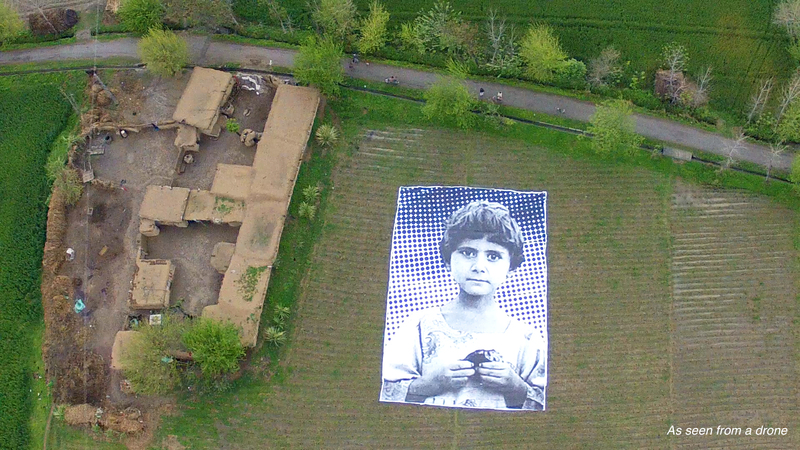 To challenge this insensitivity as well as raise awareness of civilian casualties, an artist collective installed a massive portrait facing up in the heavily bombed Khyber Pukhtoonkhwa region of Pakistan, where drone attacks regularly occur. Now, when viewed by a drone camera, what an operator sees on his screen is not an anonymous dot on the landscape, but an innocent child victim’s face. The installation is also designed to be captured by satellites in order to make it a permanent part of the landscape on online mapping sites. Ground view of the gigantic poster of the child victim. The child featured in the poster is nameless, but according to FFR, lost both her parents and two young siblings in a drone attack. 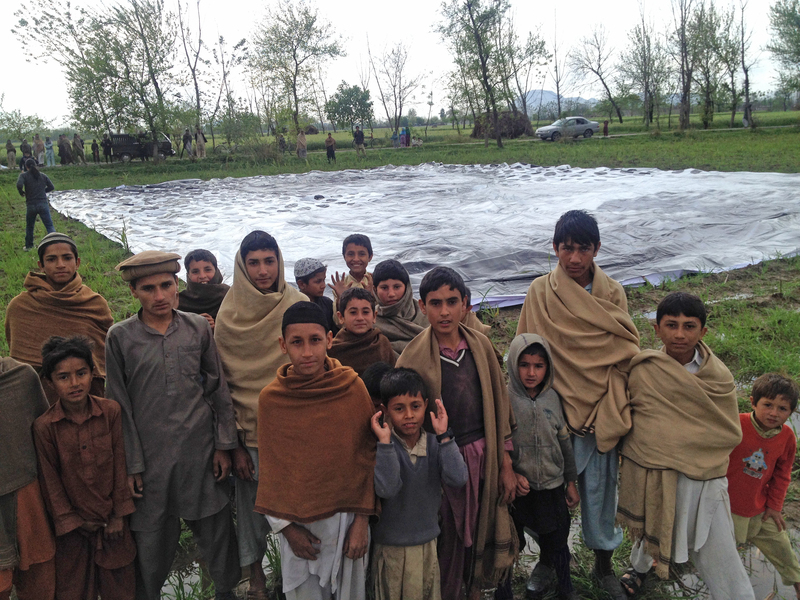 The group of artists traveled inside KPK province and, with the assistance of highly enthusiastic locals, unrolled the poster amongst mud huts and farms. It is their hope that this will create empathy and introspection amongst drone operators, and will create dialogue amongst policy makers, eventually leading to decisions that will save innocent lives. Here in the United States , our loyal hired killers may yield an involuntary blink or so in reaction to this long overdue image , before getting right back to their comfortable slaughter groove, pass the coffee please … BUT this brilliant practical resistance can surely inspire the rest of us, the vast and mostly silent overwhelming majority of us to stop OUR quiet acceptance of this insane murder policy. You’re talking about beings domesticated for the exact purpose of murder… I don’t expect any on pity them, but rather realize the greater propellants behind such happenings. They just thought it was an easier way to find a living in such a (mentally) torn landscape. “You’re talking about beings domesticated for the exact purpose of murder” “domesticated beings”… Now who is dehumanizing whom? We’re talking about good and decent people murdering each-other because their leaders each have desensitized them to the humanity of the other. Someone has to realize that the enemy is neither on the ground, nor the one flying the drone, nor Malala nor the gunman who tried to kill her. The enemy is the system that teaches them to see each other as the enemy. The enemy is a religion that teaches pedephillia, that women have no rights, that murder of innocents is ok in god’s eyes. Sorry Bob, I beg to differ. I am Muslim and neither am I nor those that are faithful to our faith pedophiles nor do we murder the innocent. Right now, the biggest mass murderer is uncle Sam. Think before you ink. As for woman’s rights? We have it long before you did. Bigotry and media brain washing only reinforces stereotypes. finally .. we are looking some awareness by locals of USA.. but there should be a fast compaign to stop voilence in other countries also .. becuase whole world hates USA .. and the result for USA can be worst than expected !!! That sounds like Roman Catholicism, and most other Christian churches too. Not quite. Actually the enemy is ignorance. You my friend have been badly misinformed of Islam and perhaps of other religions as well. When the facts are presented and the fears are dissolved, the hatred and anger wilt. Healing among humans begins when we accept our individual responsible for applying peace. John, I could not have said it better myself. Thank you. Thank you for this visual prayer. Moving to the core. May it serve to shift the tide. Beautiful project. Hope it works. Maybe giant photos of Sasha and Malia Obama might send a stronger message. Wow…now that’s a great idea. Someone is going to have to notice. How could they not. Possibly-but I wouldn’t bet my life savings on it! John you are spot on! The people in this Country Must speak out and protest the slaughter of innocent people. These are war crimes against humanity, and must be stopped. This practice is being done in our name and with our tax dollars, and it is completely unacceptable. Check out http://www.WatchingTheFilm.com for a portrayal of the PTSD effects on drone pilots. You don’t often see art as important and to the point as this! Peace and Love from Pakistan! Peace and love from the us ! I STRONGLY support the goals of this “poster”!! It is always horrible when innocents are killed. Especially when they are children. So where is the poster condemning the taliban, plo, hamas, hezbollah, and all the other terrorist groupd that INTENTIONALLY kill children and innocents as a political statement. You will seldom see anything about THAT point of view!! As a combat veteran of the mid-east, I condemn war in all of its forms. But I will also return to the fight to keep this Nation and the our people FREE. Because our land is what it is ONLY because men like me have fought and died to make it, and keep it that way. All of the folks that comment on here that condemn our Nation and our military forces should remember one simple thought: You are ONLY able to do that BECAUSE brave men have died to give you that right. If you do not agree, you are welcome to go live under a Saudi, Iranian, Russian, or Taliban-controlled society and complain about them!! Then, when you are imprisoned for speaking out, you will have plenty of time (in between torture sessions)can remember the time and place where you COULD speak your mind without fear of retribution and believe as you wish. Have a wonderful FREE day!! Bob I appreciate your comments, and even more than that your willingness to put yourself in the line of fire to protect America and Americans. My older brother and two of my nephews have also recently fought in the mideast, thus relieving me of that responsibility, for which I am eternally grateful. That said, I do not believe our commanders in chief sent any of you to the mideast to protect me, but rather for political purposes unrelated to defense of our country and its citizens. Life is not certain, and ‘defense of the country’ is also not certain, but the United States has an unfortunate history, beginning with the Spanish-American war, of sending troops into harms way for no clearly defensive purpose. Would the world be better off if the United States had stayed out of ‘foreign entanglements’ in the 20th century and beyond? No one knows. What we do know is we have tarnished our ‘beacon on the hill’ potential substantially, by acting not as protectors but as just the latest bully on the block. I don’t think we can save the Saudis, the Iranians, the Afghans, or the Russians from themselves – freedom can only be won by hard work, not by having it handed to you. It is always hard to stand by and let either children or adults fight it out amongst themselves. In most cases, however, that probably produces the best long term results for everyone. Wronge! Our Sons and Daughters are sent to “Defend” one thing only…Our CORPORATIONS and their PROFITS..especially OIL! Often, those corporations aren’t even in USA. They are not ours, they belong mostly to the 1%. You are so correct Rick. The USA and its allies need to find a better way of handling this complex situation. Nuke ’em all, let God sort ’em out. Right Bob? I’m sure your patriotic pride trumps that little child’s ill-considered scheme to live under a tyrannical government. Mom and Dad gave their lives as martyrs of freedom, &c. Swells ya with pride, don’t it, Bob. When you ‘threaten’ your compatriots who disagree with you by telling them to get out of their own country and live somewhere else – you are hardly a ‘defender of freedom’. We never told you to go to war on the other side of the world and slaughter people who had never posed any real danger to ourselves or our families. The politicians lied to us all; but you didn’t have to believe them and act on those lies. I hope these precious innocent children’s faces haunt your waking and sleeping hours forever. and no, Bob, you didn’t give me my freedom. Just for fun, sit down and read the Declaration of Independence. It will surprise you, what America really stands for. Me, I was endowed by my Creator with certain inalienable rights, including life, liberty and the pursuit. Have a nice fascism-free day. Bought right into the whole top down spin ain’t you Bob. Ever heard of General Smedley Butler? Ya’ll Should go online and have a listen so you can see who you really go to war for. You forgot to include Israel in your diatribe. Considering Israel has killed 1,518 Palestinian children since 2000 they rate at the top of hour list. What a thoughtful project. I hope for the indecent operators of drones, that the face beautiful angel resonates with them forever, they are human beings not bugs. Hope this will now drop the number of deaths of innocents right down to zero. Thank you very much for posting this and help bring to light an issue that is very painful for many Pakistanis but we seem to have a hard time showing the non-terrorist aspect of what is going on in our country to the rest of the world. Beautiful project, hope it works, poor People they habe to live with it for such a long time. I wish them peace forever. Thumbs up for your work. Hoping that at least this can abstain the US from further drone attacks. I would love to see this is an exhibit that travels around the U.S. People here need to see the faces. I believe this projects would touched many people heart from all over the world . Does not Pakistan have any kind of military defence that can prevent aerial attacks from outside? Classic response to Classic ‘MURRICA. Creative, poignant, and humanizing. Nothing cries out for justice and humanity than putting a human face on tragedy. God bless you. Good idea. I fully agree that we should limit the risk of killing innocent people. But if I were a Taliban, I would also draw a child face in my garden in order to protect myself from drones. And if I were a drone pilot, I would know what would do the Talibans, so I would decide to fire my missile even if there is a child picture near a house which is supposed to protect Talibans who usually kill innocent people. So, who has a better idea ? IIrc the Taliban are rooted i n defending their country from foreign invaders. A member of Veterans for peace -but here speaking for myself not the organization, . I support this wonderful project, but the comments here paint an inaccurate cartoon portrayal of the drone operators. They very much know the effects of their missiles, and suffer from PTSD at the same rates as soldiers serving in combat areas — not due to the stress of being under fire, but from the stress of knowing that they kill. Let’s have more great protest art like this! And music, too! We need to reach both hearts and minds. Such an amazing project. You have our love and support! After 9/11 Afghanistan and the Taliban were targeted because they harbored the Al Qaeda. Now the mountains of Pakistan are the target for the same reason. The drone strikes are a measure used to actually reduce the civilian and military casualties and avoid a full out war, with troops on the ground, in the mountains of Pakistan. Do I believe we can eradicate Al Qaeda and end their religious war? No, but I do believe these religious zealots/terrorists understand only one thing and that is a show of force. Obviously using warfare is not the answer for attaining World Peace. If all the nations and people of the world were to look at everyone else as equals, equally deserving of living in peace and harmony, then this world might have a shot. But sadly there is greed and there are zealots in this world and until they are eradicated then we have little hope for World Peace. I feel we have not fully explored the possibility of simply defending our borders from attack, and allowing the rest of the world to find their own solutions to the quest for peace. Perhaps the Taliban is bad for Afghans – shouldn’t that be their cross to bear, not ours? It is obviously a country divided, and when we champion one of the sides then it makes us the enemy of the other. Did Osama bin Laden attack the United States because he wanted to take our freedoms away from us, or because he objected to our troops in Saudi Arabia? Were we to stay home, protect our borders, and stop assuming everyone else’s business was our business, would this increase or decrease the number of non-Americans who want to hurt this country? World peace may not be attainable in our lifetimes, but how about just trying for ‘country peace,’ that is to say, peace in the United States? Beautiful in its simplicity. Peace. Why doesn’t Pakistan go the International Criminal Court (ICC) over this drone program??? historians have so thoroughly quoted the other person in academic papers that no one realizes that North Carolina had a different history before 1976.
military operations in parts in the region but we do not use their bases for our current operations inside region. However, his popular theory was twisted in the American Revolution to something else. People like Bob are the most ignorant on the planet, so are most of the American masses. Who has threatened your freedom? Who has interfered in your country? Who has killed your brave men inside your country? No one. Then why you? Why do you send your so-called brave men to be killed in Mideast or elsewhere outside America. Don’t you people possess a heart, even a brain to think? What do you lack in? Oil? You can buy it with your dollars. What do you lack in? Peace? You can bring it with letting others live in peace? What do you lack in? Conscience? Sorry nobody will help you awake it. You, the people of America will have to do it for yourself. If you are so crazy about the killing of few of your so-called brave men, why don’t you think of the mass killings in the world due to you. We, Pakistanis want to live in Peace. Please let us be what we are. You have no harm from Islam. It is the most peaceful religion of the world. The people you claim to fight, do not have any religion. We, the people of Pakistan do not support such ideas. So be Americans and be in America. And let us be what we are. a emblem new reader. What may you recommend about your publish that you made a few days ago? Hi, your help would be greatly appreciated. Could email me at sakafridi at gmail dot com? Thanks for your help. We’d be interested in your help for the SEO tricks. Please let me know if that’s something you still want to do.